Reclamation centres are wonderful places to pick up that bargain object for the house or garden be it a fireplace or surrounding mantle, or some doors, or a huge garden sculpture. Also usually on offer are building materials, surplus to needs at a building site, bought by the reclamation centre, and offered at cut price to you, the consumer. These centres have always been private business centres, set up entrepreneurs recognising the gap in the market between salvage from building sites and other larger operations, and the consumer, or small-scale builders, looking for small amounts of materials, or odd pieces of timber, furniture, or suchlike. Now, with the focus on the environment and the sustainable development of the planet, these centres are very much part of the shift to buying sensibly and ethically, and also disposing of materials effectively and conscientiously. Partly due to good business sense, and partly due to Governmental and political incentives, some centres, and some plant contractors and other sorts of building industry firms, have got in on the act and extended their operations to include the reclamation, storage and potential resale of inert materials, including stone, brick, concrete, and tarmac. One such centre advertising online offers these products and “crushed recycled aggregates, between 100mm and dust.” Other goods available are topsoil for the garden, in virtually any quantity you require. Delivery is also usually available, the more you order. The environmental benefit of having such centres is enormous, as the materials are not just automatically tipped into landfill sites. The centres work on the assumption that if they save something, and store it (these centres are usually vast and sprawling), someday, sometime, someone will wander it and want it. In the meantime other customers will want other goods and products, so stuff can just sit in the yard until then. This approach can also fire builders and designers imagination – by going to a reclamation centre and building with what you find on the day, it gives a unique approach to a building or design project. 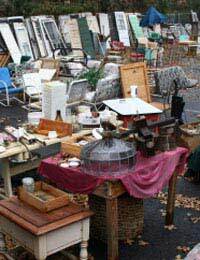 So get out to your nearest local Reclamation Centre and see what you can find!